Fountain Saved for Another Year! 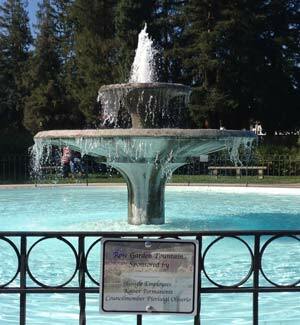 Several years ago, the City eliminated funding of 6 decorative fountains in San Jose Parks. Initially, Councilmember Pierluigi Oliverio requested and received budget extension for the Historic San Jose Municipal Rose Garden as the fountain generates income for the City with Weddings and photo permits. It also allowed some time to develop a mechanism for private funding of the fountain. Private funding was obtained by grants submitted by Terry Reilly from Councilmember Oliverio, donations from Google Employees and matched by Google, and the Kaiser Permanente. We are happy to announce Terry was able to secure funding for 2013 from these same sources. The fountain will continue to flow through 2013!